CBRE Group provides commercial real estate, residential property, and investment services on every continent around the globe. The company was founded by Colbert Coldwell more than 100 years ago and is based in Los Angeles, California. CBRE Group (NYSE:CBRE) stock applies very well for trend following strategy. The stock has powerful fundamentals and bright technical profile. At least the last four reported earnings have beaten the estimates. The revenue has been significantly rising on annual basis. CBRE Group has been trending upwards for almost 2 years. This bullish trend was paused by February market correction. 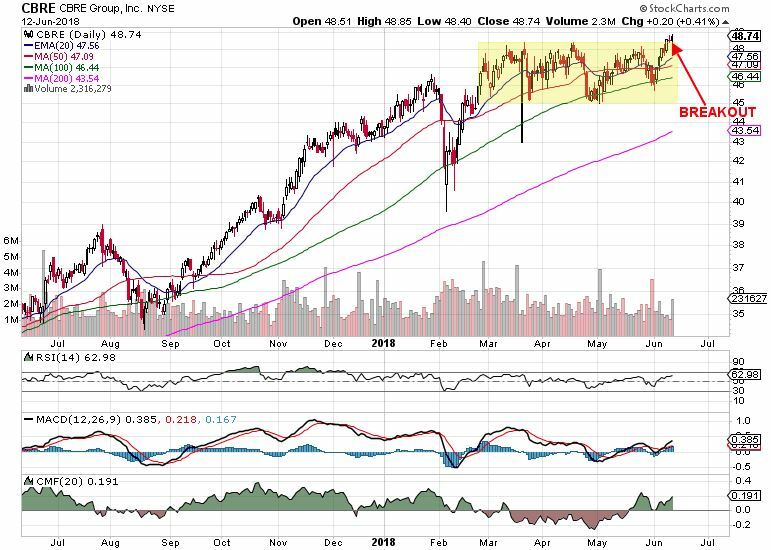 The stock shook it off quite quickly and returned to high places within 2 weeks. As the entire stock market has been consolidating in various shapes and uncertainties, CBRE Group has started its consolidation forming a Rectangle Pattern. The pattern had been developing for 3 months until a price broke through the resistance last Friday. MACD – signal line crossed by MACD and entered positive territory. This is not a stock that is going to bring you fast cash in form of enormous stock price increase. This is a stable company that is going to constantly trend higher with little price swings. The stock is suitable for long-term investors and trend followers. Property management industry is on a trendy path and CBRE Group is a strong player here.